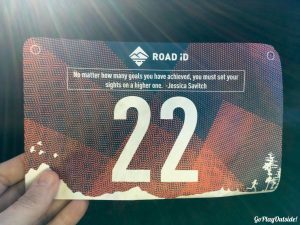 Bad Little Trail Run – Go Play Outside! 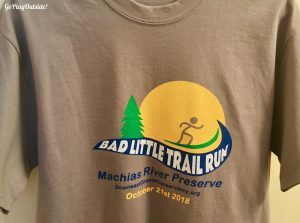 On October 21st, Frosty and I ran in the Bad Little Trail Run in Whitneyville at the Downeast Coastal Conservancy’s Machias River Preserve. 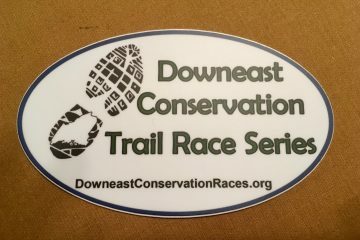 This race was part of the Downeast Conservation Trail Race Series. There were two distances to choose from: 2.5 or 7 miles. It was a cold, but clear day with a side of wind. Frosty and I picked up our bibs and race shirts. Since this was a small race, there weren’t any lines at the porta potty! I am a SLOW trail runner. So my only concern was the two hour cutoff. I thought that I could finish in under two hours, but I wasn’t sure what my performance would actually be. The 7 mile race started first. I lined up in the back with a couple other women who were expecting to be on the slow side. Before the race started, the sweeper said to those of us in the back not to be too slow, so she wouldn’t get too cold. Way to apply the pressure! She may have been joking, but her tone didn’t sound like it. I am at peace being in the back of the pack at races, but this is still not cool. The course was partly on single track trails and partly on sections of the Down East Sunrise Trail. 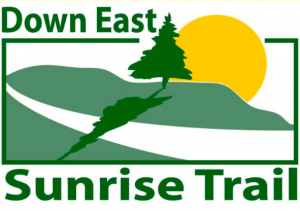 This was the first time that I had been on the Down East Sunrise Trail (DEST). 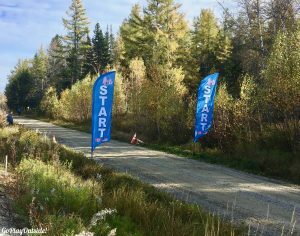 The DEST sections that were on the race course were like dirt roads. I tried to make up for my slow trail time on the DEST sections. 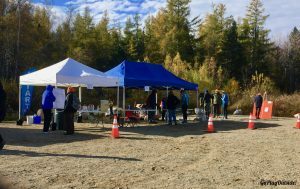 There were two water stations along the course. This race was much more technical than Race Through The Woods. The single track trail sections had roots, and rocks, and even went over a beaver lodge! When I went over the beaver lodge, I had visions of my foot breaking through the dirt and sticks, and dangling in the house of an angry beaver ready to chomp my foot. Luckily, that didn’t happen. During this race, I had lots of little stumbles, but no falls, or Superman style big trips. The trail was marked with flags throughout. In the beginning, the flags were very plentiful and extremely close together. Later on the course, the flags were spread out more. At one point, I zoned out. When I snapped back to reality, I didn’t see any flags. I turned around and started running back in the opposite direction. Soon, I saw a flag and turned back around. I managed to stay on the course for the entire race. The race went by some nice views. I love the blazing red of blueberry fields in the fall! Even though the fall leaves were past peak, the course still had beautiful color on the trees and in places a carpet of fall leaves on the ground. 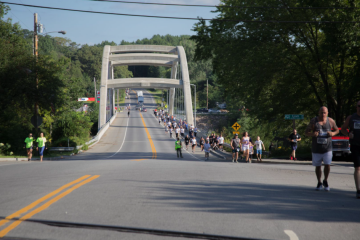 The course had scenic views of the Machias River as well. I was the last in my age group to finish, but I finished well before the cutoff at 1:39:14.3! Frosty had finished 15 minutes before. He met me out on the course near the finish to cheer me on. After I finished, he hit the beer tent. 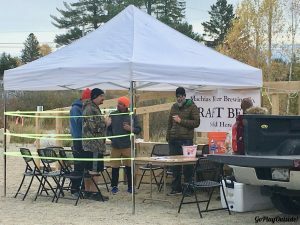 The Machias River Brewing Company(MRBC) had set up a tent. There were two choices of beers. a white wheat beer and an autumnal IPA. Frosty got a glass of the IPA for $5. Since this race was small, I’m sure MRBC lost money on this set up. After the race, there was a luncheon in the nearby Hillgrove Community Hall. The luncheon was free for runners. Others could buy a ticket at the door. Frosty was a little disappointed that there wasn’t any chili as was mentioned in the pre-race email. There were a lot of other choices available. They had chicken, ham, and egg salad sandwiches; regular tossed salad, and a corn, tomato, and mozzerella salad. There were also veggies, dip, fruit salad, cheese, and crackers. So, Frosty found plenty to eat. The desserts were the star of this luncheon for me. 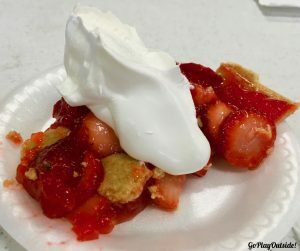 They had pies: raspberry, banana cream, and a strawberry jello pie with a cookie crust. They also had an assortment of cookie flavors and little cupcakes. The award ceremony took place during the luncheon. They had overall and age group awards for both distances. They awards were of a wood burned design on tree slices. 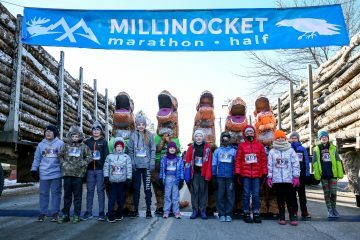 33 runners participated in the 7 mile race, and 21 ran in the 2.5 mile race.